Orange Chocolate Cantucci Biscuits. Crunchy and sweet Italian biscuits filled with melting chocolate chips made for dunking in sweet little glasses of Vin Santo. This recipe couldn’t be simpler and it’s very hard to get wrong. 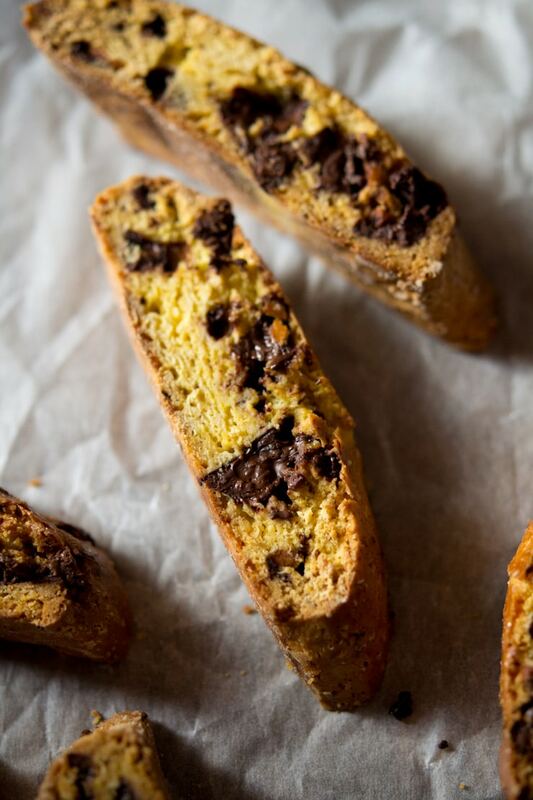 These little chocolate cantucci biscuits are filled with chocolate chips and orange zest and literally take less than 10 minutes to make before being put in the oven to be twice baked to perfection. Cantucci are Italian cookies that are twice baked and traditionally made with chopped almonds. They originated from Prato, Tuscany and are dry and crisp making them great for storing for long periods. These yummy little cookies are designed to be dunked into a glass of something special such as Vin Santo which is a delicious, sweet Italian dessert wine that warms the cockles during the colder months. Cantucci is the Italian name for these traditional cookies although they are known in the US as biscotti. 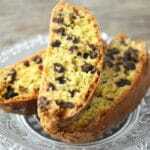 Biscotti in Italian is the name for biscuits or cookies in general. I’m maybe being a little hasty here since these are much more of a winter type cookie in Italy and are very popular around the festive period but I love them and when the weather cools down at this time of year (ok I might have to wait another 2 weeks it’s still kinda warm), the hot cups of tea get poured and the cantucci get baked in the oven all the way up to Christmas. I’m obsessed with that ‘cosy’ feeling and these kinds of things make me happy. I loaded these ones with dark chocolate chips and juicy orange zest which gives them such an amazing flavour, orange and chocolate is such a classic combination and always works perfectly in any type of cookie. 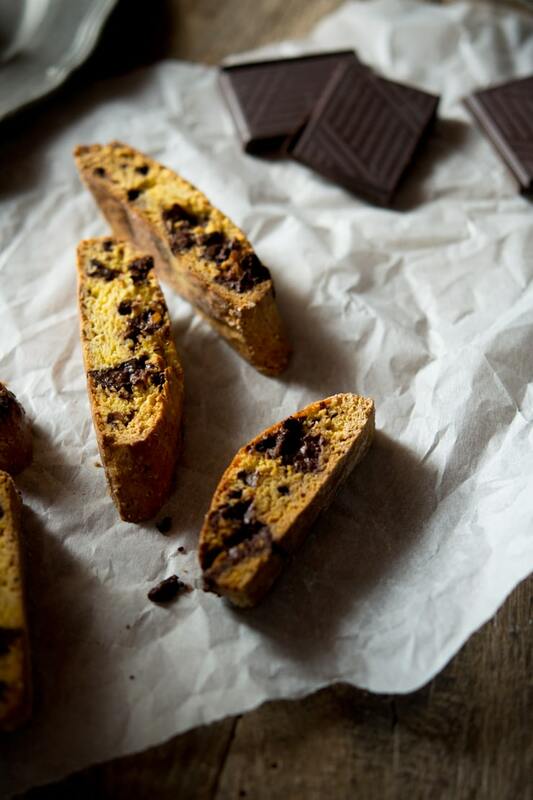 This is such an easy recipe, you can whip up a batch of warm, orange chocolate cantucci biscuits in no time. I mix together all the dry ingredients with some eggs and honey which gives the cookies a lovely sweetness. Then I mix it all together until it forms a dough and tip in all the yummy chocolate chips or roughly chopped chocolate. I then form the dough into a rough ball and cut it in two. The two halves are then shaped into two flat log shapes, brushed with egg white and baked for around 20 minutes. Once the baked logs are cool enough to touch they are cut diagonally into oval shaped cookies and then baked again for another 15-20 minutes until they are lovely and crisp but not coloured. They can then be served warm, oozing with smooth melting chocolate and then dunked into little glasses of Vin Santo or big cups of tea. SO MUCH YUM! 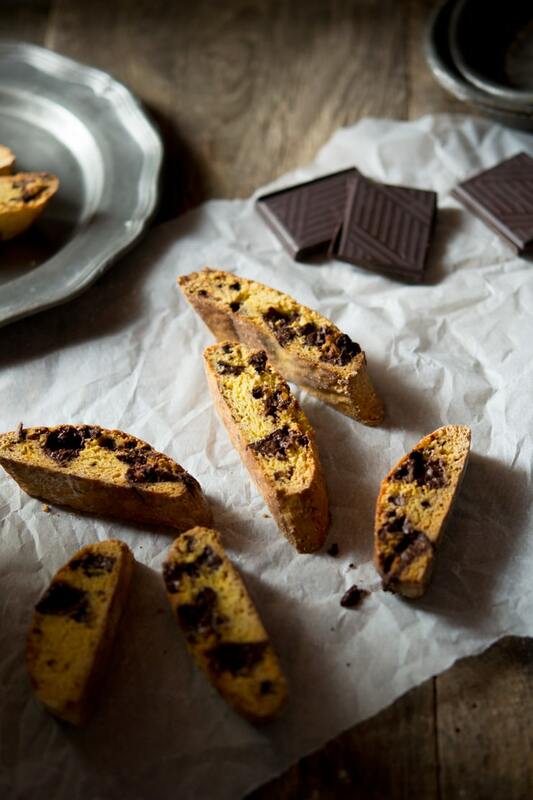 If you’ve tried these chocolate orange cantucci biscuits or any other recipe on the blog then don’t forget to rate the recipe and let me know how you got on in the comments below, I love hearing from you! You can also FOLLOW ME on FACEBOOK, TWITTER, INSTAGRAM and PINTEREST to see more delicious food and what I’m getting up to. Preheat the oven to 180°C/350F/gask mark4. Place the flour, sugar, salt and orange zest in a large mixing bowl and mix together. Whisk together 2 eggs and 1 egg yolk (set aside the egg white in a bowl) with a fork and add the honey. Make a well in the centre of the flour mixture and add the eggs and honey. Using a fork whisk the eggs gradually incorporating the flour mixture until a dough forms. Add the chocolate chips and knead until they are evenly dispersed throughout the cookie dough (you may need a little extra flour if it's too sticky). Cut the dough in half and shape into two logs on two lined baking trays roughly 2cm thick and 4 cm wide. Brush the logs with remaining egg white and bake in the oven for around 20 minutes until golden. Turn the oven down to 130°Once the cookie logs are just cool enough to touch cut them diagonally into individual cookies. Place them flat on a baking tray and bake in the oven for around 15-20 minutes until nice and crisp but not coloured. Serve warm. Yum! These are perfect for the holidays coming up. I love the combination of orange and chocolate. I bet the pinch of smoked salt adds a little extra something. Gosh this is making me want a chilly morning, a bathrobe, and some properly strong Italian coffee to go with it. LOVE dark chocolate and orange together! OH MY! That was what I said out loud when I saw the first photo. They look awesome. Sharing! Yum! These look great. Love the use of orange! These look simply amazing! I love that you can chunks of the orange zest in them. I have never made a twice baked cookie but maybe I need to rectify that! I’ve never heard of Cantucci, but these remind me of biscotti — and the flavor combo is a winner, for sure. I love that you serve this with vin santo! Absolutely gorgeous cookies! I love the combination of chocolate and orange and the color looks so beautiful. Definitely perfect for Christmas. I love the combo of the chocolate and the orange, it’s so very fall! This looks incredible! I love the combination of orange and chocolate, especially around the holidays! Thanks. Reminds me of a biscotti and looks wonderful! Love the chocolates orange combo. I absolutely adore ANYTHING with chocolate and orange flavors, and I happen to LOVE Cantucci biscuits, too! I would love to include these in my Christmas cookies that I give to friends and neighbors! Aw thanks Christina that’s a great idea, I love these at Christmas time!